How fun! 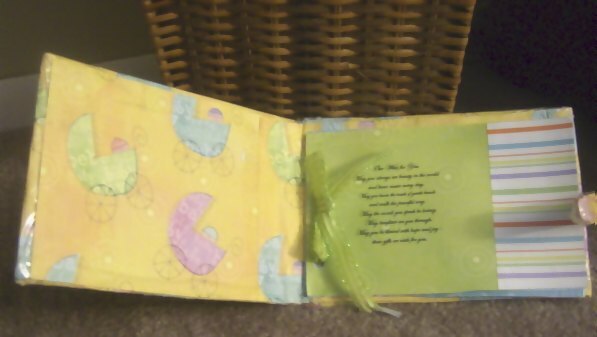 Latoya shared a blessings scrapbook she made for a recent baby shower. I love this type of scrapbook because it holds sentimental details of who was at the shower and any advice or wishes that they have for the expecting mom. I love that Latoya crafted her own special version of it out of cute scrapbook paper and fun buttons. It turned out adorable. Great Job Latoya! Thanks for sharing your project with us! I made this book so that the Mom-to-be and later the child him/herself could look back on who was there and read the blessings they wrote for the baby. It is cardboard covered with scrapbook paper. I used the plastic from the scrapbook paper to cover the outside of the book. 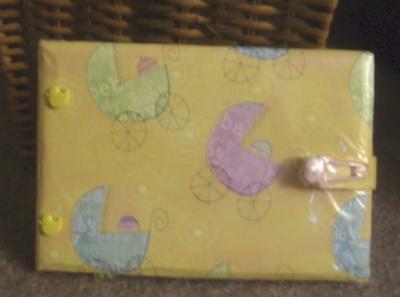 I used ribbon to hold the various scrapbook pages in the book and make a Velcro closure that allowed for expansion. The ducks and the bear diaper pins are actually buttons I added just for fun. This scrapbook is so fun! I made a similar baby wishes book for my friend's baby shower last year. Her and her husband tried for a long time before they were able to get pregnant. I had all the guests sign their name and give wishes for the new baby and family. It turned out to be a real treasure for the family to read as the baby grows. On the first page, I added a poem. To go with the poem, I had a jars filled with pennies around the room with a sign that said "wishing for a baby". I found the poem on a website www.welcomebaby.com. I think the owner Chris wrote it. She is very talented. Everyone loved the poem. Hope everyone likes my idea. Join in and write your own page! It's easy to do. How? Simply click here to return to Baby Shower Crafts.